Students can use the Hummingbird to get some hands-on experience with important concepts such as the Coriolis effect. 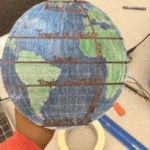 Students will research the Coriolis effect and how it affects weather and flight paths. 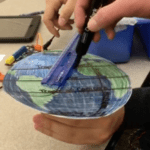 Students will design and construct a model to demonstrate their understanding of the Coriolis effect. Students will create videos showing their robots with voiceover explaining their research and model. This project is aligned to Next Generation Science Standard MS-ESS2-6, “Develop and use a model to describe how unequal heating and rotation of the Earth cause patterns of atmospheric and oceanic circulation that determine regional climates,” as well as the middle school engineering standards in the Next Generation Science Standards (MS-ETS1-2 and MS-ETS1-3). This project also meets ELA anchor standards involving research (CCRA.W.7) and speaking skills (CCRA.SL.1-CCRA.SL.6). At first, earth science standards may seem far beyond the reach of a robotics activity. However, students can use the Hummingbird to get some hands-on experience with important concepts such as the Coriolis effect, the phenomenon that determines the direction in which a storm rotates. Stephanie Reilly’s earth science students at Plum High School used the gear motor to create Hummingbird models of the Coriolis effect and then produced videos to explain what they learned. This project took place in a learning support class over five 42-minute sessions. While these students struggled in some academic areas, they were highly engaged in building and programming the robots, and their videos reflect their understanding of the project’s science content. Introduce students to the Coriolis effect. For a nice explanation, see the PBS video The Coriolis Effect. Students must create a robotic demonstration of the Coriolis effect. Students must produce a tutorial video that includes their demonstration and information about the Coriolis effect. If desired, show students the video below to demonstrate how the gear motor might be used to demonstrate the Coriolis effect. 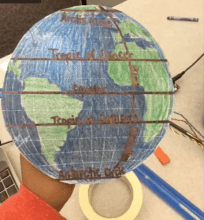 Encourage them to take their projects further by using a picture of the Earth or even a small globe. Students will need to create a sturdy mount for the gear motor, and they will also need a guide to so that they can move a marker or pencil in a straight line. As the motor turns, the user follows the straight-line guide, but because the platform is turning, the drawing becomes a curve. By varying the speed of the motor, students can investigate how the speed affects curvature. They should use different colors to make it easier to tell the curves apart. As an extension, students could be challenged to devise a way to measure the curvature or to investigate the effects of varying the speed while the user is drawing. NOVA PBS. (2013, July 19). The Coriolis Effect [Video file]. Retrieved from https://www.youtube.com/watch?v=i2mec3vgeaI. Parvez Jamal. (2009, April 19). Mr. Aubrey Explaining How to Demonstrate Coriolis Effect [Video file]. Retrieved from https://www.youtube.com/watch?v=7DVL0ugj1O4.